Our model will feature a transparent side and interior load. This 50’ standard box car with 8’ plug door no roofwalk and short ladders is red with white lettering and runs on Bettendorf trucks. Crazy Train Hobbies - Y2PLAY. Category: Freight Cars. Standard Cupola Caboose. Northern Pacific. PULPWOOD FLAT CAR. Detailed simulated pulpwood load". "Undecorated". Master Line Series Freight Car. Crazy Train Hobbies - Y2PLAY. This 40’ standard box car with single door with no roofwalk is red with white letteirng and runs on Bettendorf trucks. Repainted in the 1970s in bright red with the large Multimark herald, this 3900 cubic foot, 40’ car was originally built in the 1940s and belonged to series 115520-125610. Canadian Pacific CP Rail. Photo Provided by PnP Trains. 50' Standard Box car Plug Door w/o roofwalk short ladders. Photo Provided by PnP Trains. Factory painted - you will need to finish painting and detailing. This 50’ standard box car with 8’ plug door no roofwalk and short ladders is light blue with colorful graffiti. Crazy Train Hobbies - Y2PLAY. Category: Freight Cars. This 40’ standard box car with single door, full ladders and no roofwalk is painted gray with maroon band and ends and yellow stripe. They later lost their signal & steam lines and were assigned to the general freight car pool. H2a 3-BAY HOPPER. Norfolk Southern. Minimum 9.75" curve radius for operation. Realistic removable coal loads. Detailed bay interiors. Sclair Polyethelene ACF 3-Bay Center Flow Covered Hopper. These cars now bear the reporting marks 'NCLX', replacing Dow's DOCX marking. MTL # 993 00 114. Micro-Trains Line. New & Still in the Collectible Case. Originally converted in the mid 1960’s into an impact demonstration car, CN later rebuilt and repainted it to black and white in 1978. Our model will feature a transparent side and interior load. 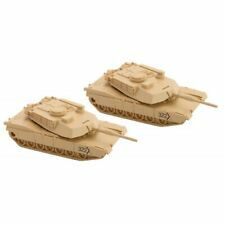 New ListingBLUFORD SHOPS N #63091 2-Bay War Emergency Composite Hopper GM&O #60505 NIB! This 40ft Standard Box Car is part of a mini-series of Military Box Cars. Crazy Train Hobbies - Y2PLAY. Item Number: 02000467. • Fully-assembled and ready to run out of the box. • Minimum radius: 10". • Weighted for trouble free operation. • Highly-detailed, injection-molded body. This 50' standard box car with plug and sliding doors and no roofwalk is painted box car red with white 'wet noodle' CN logo and white lettering in both English and French. It was built in December 1972 and runs on Barber Roller Bearing trucks. MTL #022 00 191. New & Still in the Micro Trains Case. Union Pacific 40' Standard Box Car. 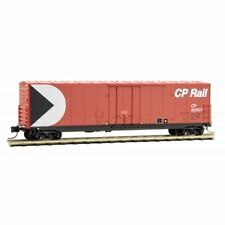 These 40’ standard box cars with plug & sliding door are synthetic red with white lettering and run on Bettendorf trucks. Crazy Train Hobbies - Y2PLAY. Category: Freight Cars. • Crisp detailing. • Improved Dreadnaught ends. Category: Freight Cars. Item Number: 99300146. This 40ft. 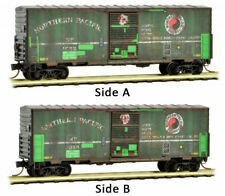 standard box car with sliding door is decorated for NP and features factory patched paint and weathering. Crazy Train Hobbies - Y2PLAY. Southern Pacific® coverted this 50’ box car with plexi-glass on one side and standard solid steel on the other. This model is ready-to-roll. A great addition for any N scale enthusiast and makes a wonderful gift! The difference often varies 24 hours or more. Worst Case example However, we may not be able to identify all defects. 40' STANDARD BOXCAR. by Micro Trains Line. Great Northern. (DOUBLE PLUG DOORS - W/O ROOFWALK). New & Still in the MTL Case. This 50' standard box car with 10' single door, no roofwalk and short ladders is green with large yellow band and runs on Roller Bearing trucks. Reading 'Patriotic' Freedom 50' Standard Single Door Box Car. Category: Freight Cars. Item Number: 02044167. Rd# 329140. 50' Standard Box car Single Door w/o roofwalk short ladders. 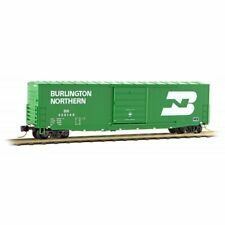 Burlington Northern BN. Photo Provided by PnP Trains. 6464 Special Run. Missouri Pacific Boxcar. Photo Provided by PnP Trains. 40' Standard Box Car, Single Door. Micro-Trains MTL N-Scale 50ft. Double Door Box Car Wisconsin & Southern/Graffiti. This 50ft. 40' AIRSLIDE HOPPER. Dixie Crystals. 70 Ton roller bearing trucks. 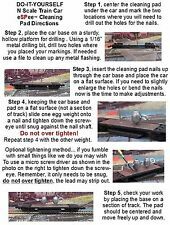 Realistic roof walks & brake line details. This 50’ standard box car with 8’ double sliding doors no roofwalk and short ladders is blue with yellow lettering and runs on Bettendorf trucks. Belonging to series 28250-28999, they served into the 1990s before being retired. This car is ready-to-run. N RTR 50' NACC Box/Weathered, ALUMAX #50190. A great addition for any N scale enthusiast & m akes a wonderful gift! Key Features. Worst Case example The difference often varies 24 hours or more. This 50’ standard box car with 8’ double sliding doors and no roofwalk and short ladders is reddish brown with white lettering and runs on Bettendorf trucks. Built in November, 1957 for Canadian National and assigned to auto parts service. New Brunswick Provincial Car. Micro Trains. Photo Provided by PnP Trains. 50' Standard Box Car Single Door, w/o Roofwalk. This 50’ standard box car with 10’ single door, no roofwalk, and short ladders is yellow with aluminum roof and a large UP shield and runs on Bettendorf trucks. Union Pacific received 1,250 of these cars in several series blocks, with this car being of series 500200-500399. 40' WOOD REEFER. (Pacific Egg Producers). Simulated wood car body. 40 Ton friction bearing trucks with Accumate (R)couplers. Accurate printing & printing. This 50’ standard box car with double doors is red with white lettering and runs on Bettendorf trucks. This car was built in August 1957 for Great Northern Railway as part of series 35500-35749. Item Number: 03400420. This 50’ standard box car with 10’ single door no roofwalk and short ladders is green with white lettering and runs on Roller Bearing trucks. Built in 1962 for Frisco as part of series 329000-329149 it is 4,928 cubic feet in capacity. 6464 Special Run. Central of Georgia Boxcar. Photo Provided by PnP Trains. 40' Standard Box Car, Single Door. MTL #020 00 097. Western Pacific 40' Standard Box Car. 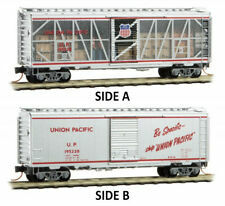 This 40’ standard box car with single door is painted box car red with white lettering on sides and ends. Built March 1953 from lot number 8100 by Pullman Standard, this is one of 500 cars which were equipped with Youngstown doors. This 40’ standard box car with plug & sliding door is glacier green with red markings and runs on Bettendorf trucks. Car is in collected only condition and not run, box may have minor shelf wear.